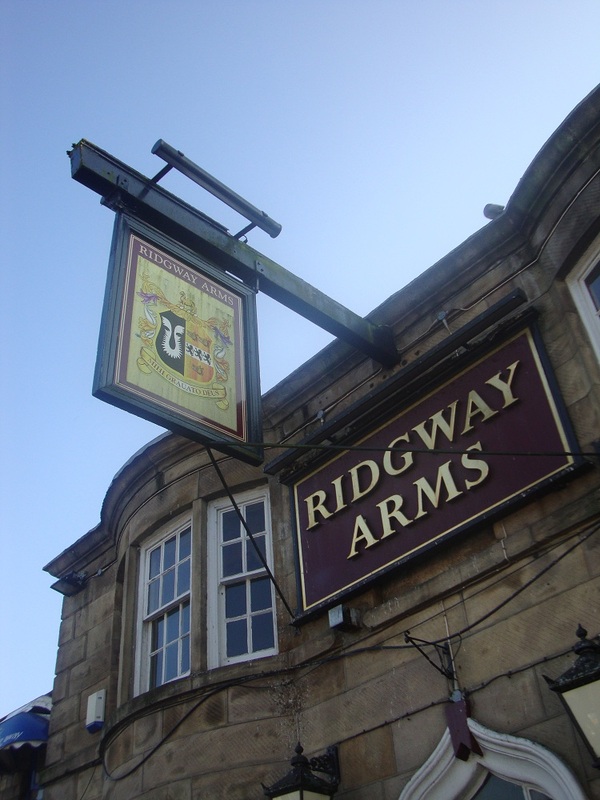 The Ridgway Arms derives its name from the Ridgways, a local family who built and owned Horwich bleachworks. They leased the Wallsuches site in 1777. Originally, the arms of the Ridgway family would be hung outside the pub, instead of a name as a lot of people couldn't read. 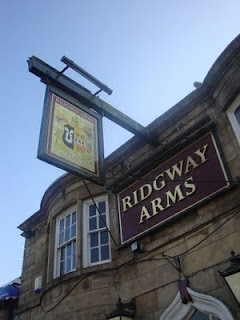 People would be told to go to the house with the sign of the Ridgway Arms. Eventually this caught on and became the name. The building, with its bow windows flanking the main door, and a doorway whose head is an ogre shaped arch, is late Georgian in architecture, dating the origins of the building to around 1810-1825. John Champness, author of 'Lancashire's Architectural Heritage' declares the Ridgway Arms as "one of the most attractive late Georgian public houses" he knows. It certainly existed by 1825, when it appears in one of the early Lancashire trade directories, the Baines 1825/6, naming James Fowler as the landlord. James Fowler stayed at the Ridgway until at least 1840. At some point during the 1840s, the pub was also held by Robert Weaver. The pub can be seen on the 1849 map of Adlington. 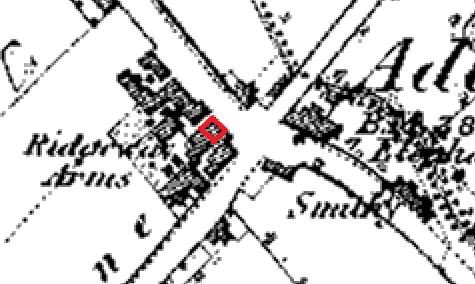 An enlarged version of the 1849 map of Adlington, showing the original Ridgway Arms building in red. The buildings behind are now also a part of the pub. Inquest - A coroner's inquest was held on Wednesday last, at the Ridgway Arms, Adlington, on the body of Mrs. Morris, wife of Mr. Morris, landlord of the above inn, who put an end to her existence by hanging herself on the Sunday morning previous. She had been for some time in a low desponding state of mind. She was found suspended by the neck in one of the attics, and when found was quite dead. The jury returned a verdict of "Temporary insanity." I have found no other mention of these Morrises in reference to the Ridgway, but I think it highly likely that Mrs Morris was the 45 year old Ellen Morris who was buried at Christ Church in Adlington on 6th June 1849, the same day as the inquest. This would make her husband, the licensee, Thomas Morris. Disorderly Butcher : Francis Dickonson, butcher, of Adlington, was charged with assaulting Sarah Bradley, on the 16th February. Sarah Bradley said that she kept the Ridgway Arms public house, in Adlington. On Sunday night, the 16th February, the defendant went into the house, and sat in the kitchen, he called for a glass of ale, which was supplied to him; he then became very abusive. Having had something to drink, the company in the kitchen left, and went into the bar parlour, and the prisoner wanted to go in after them, when witness refused to let him go, and, in preventing him doing so, he got hold of her by the arm, and threw her down in the lobby. Witness's son-in-law then put the defendant out of the house, and immediately afterwards, two panes were broken in the bar parlour window, and in the kitchen window. Betty Laxham said she saw defendant break two of the windows. The defendant was ordered to pay 1s. 10d., the damage done to the windows, and was fined 5s., and costs for the assault. Isaac Mather was the landlord upon his marriage in 1865 (no apparent relation to the Isaac Mather who later had the Bottom Spinners), and he remained there until at least 1869. By 1871, the licensed victualler was Thomas Walton. Little is known about him at the moment, but he wasn't there long because by 1872, James Turner was there. James died in 1875, aged 49, and trade was continued by his widow, Mary Turner. She did so until at least 1882. By 1884, the landlord was John Hough who had the pub until his death in 1902, after which the pub was taken over by his son-in-law Levi Lamb, who was married to John's daughter Mary Alice. Levi's elder brother Charles was married to another of John Hough's daughters named Jane, and they ran the Bridge Inn in lower Adlington for over a decade. Levi ran the Ridgway until at least 1911. 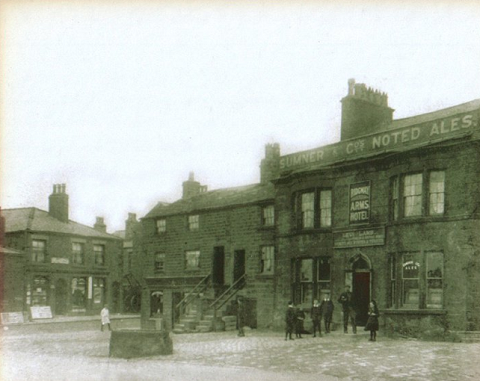 The Ridgway Arms c1908. The licensee's name above the door is Levi Lamb. This page is copyright Kimberley Moss. Contents may not be reproduced without permission. All information found on this site is factual and correct to the extent of my knowledge. There is no intent to cause offence to any individual. Should you spot an error please let me know and that error will be corrected. Template images by richcano. Powered by Blogger. This work is licensed under a Creative Commons License. For more information about material found on this blog, please contact me.